In this candid personal memoir, the honorable gentleman from Minnesota takes his army of loyal fans along with him from "Saturday Night Live" to the campaign trail, inside the halls of Congress, and behind the scenes of some of the most dramatic and/or hilarious moments of his new career in politics. Has Al Franken become a true Giant of the Senate? Franken asks readers to decide for themselves. I've always like Al Franken, back to the days of Stuart Smalley on Saturday Night Live. Even so, I was one of those people who was very skeptical to hear that he was running for the Senate (albeit from Minnesota which, at the time, was the "Jesse Ventura State" in my mind). However, he has truly impressed me as a statesman since he (finally) took his seat in the Senate. My listening time is devoted to two things: podcasts and audiobooks and, in the case of the former, much of my focus is on news podcasts at the moment. So, really, this book was the perfect merger of all that and this was the perfect, or surreal (more on that later) time for me to listen to it. Franken devotes the first few chapters of this book to his upbringing and his time at SNL. While hearing about his earlier life was interesting, the chapter or two devoted to SNL was probably the least interesting part of the book to me. It wasn't because it was boring or badly written, because it wasn't. It was just after reading and/or listening to so many other books by former SNL-ers, he really had nothing new to say there. I guess the fact that everyone seems to say the same thing about their SNL years means that it is all true? Once we get past that, the book picks up. I was fascinated to hear about his first run for the Senate, which he won by the narrowest margin in history. As I don't live in Minnesota, I wasn't aware of the details of that entire situation and Franken explains the details of it well. More entertaining, though, was how Franken recounted the beginnings of his ongoing battle with not being allowed to be funny and having his comic past returning to haunt him in the political arena. This is a theme that is woven through the rest of the memoir, never so much that it overtakes the narrative, but enough that we don't forget that this is Al Franken we're dealing with. Here is the surreal part: I know that there is a turnaround with books. Generally, one does not just write a book (and record an audiobook) only to have it released in a few days or weeks. Yet, there had to be some sort of push to get this one out as it goes up to the very, very recent past. In fact, it didn't seem like the past at all. You see, I was listening to the chapter on Health Care on July 27th. Let me put that in perspective: while I was listening to Al Franken lament what he thought would be the inevitable repeal of the ACA, the Senate was debating Repeal and Replace, which was ended failed, many thanks to Republican Senators Collins, McCain, and Murkowski. So, when Al Franken says (paraphrased) "I don't know if we will still have the health care by the time you hear this," it was oddly true. 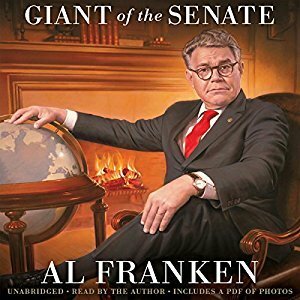 I can't imagine anyone other that Al Franken reading this book. Normally, I'm wary of political memoirs read by the authors because, well, they aren't the best narrators. Al Franken, however, with his background in the Entertainment industry and dry humor, is perfect for this. Plus he does impressions of his fellow Senators. That alone was worth the Audible credit for this one. And, don't worry, even if he was to work to not be funny in his Political life, there are still belly laughs to be had. And, yes, this kind of feels like a book from a person who is gearing up for a Presidential bid. In every interview, Al Franken is adamant that this is not the case...but, you know what? I'd vote for him.